The common thread that winds throughout our book is that dementia may define a set of symptoms, but dementia cannot define a life. Our goal in writing this book is to give very real, practical help to caregivers as well as giving them a road map to finding peace and even joy in their caregiving journey. 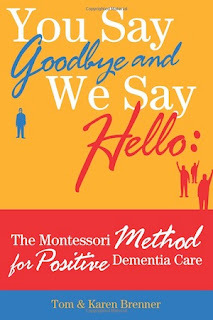 Our first book, You Say Goodbye and We Say Hello: The Montessori Method for Positive Dementia Care has been published and is now for sale. It is a very exciting time for us. 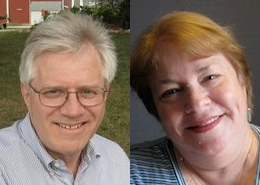 The book is the end result of many years of working directly with people living with dementia and their caregivers, both family and professional caregivers. We have worked in long term care homes, adult day centers and memory enhancement clinics, field testing The Montessori Method for Dementia Care. Over the last few years, whenever we would give a talk or hold a training seminar, people in the audience would ask us where they could buy our book. We would sheepishly answer that we didn’t have a book. The final push to write a book came from a nursing student who attended one of our talks. She told us, in no uncertain terms, that we owed it to the caregiving community to write a book about our work in the field. We knew in our hearts that this young student was absolutely right and so we began the long process of writing our first book. The inspiration for the theme of You Say Goodbye and We Say Hello came to us one day when we were reading about a woman whose husband had just been diagnosed with early onset Alzheimer’s. In her article, this wife wrote that she spent an entire afternoon in a large bookstore, sitting on the floor, looking through all the books about Alzheimer’s; she was not looking for medical explanations, or how-to books, but rather she was frantically searching for a book that would help her understand how to be, how to act, how to live her life now. Once we read this article, we knew that this was the audience for our book: the person who is searching for guidance, for understanding, for ideas and for hope. In our book, You Say Goodbye and We Say Hello, we provide guideposts for the readers; simple but effective tips on how to continue to live a full and rewarding life, even when your life has been impacted by dementia. Along with many easy-to-follow exercises for caregivers, each chapter contains narratives of people who are living with dementia. We wanted to make sure to include their stories and show how the Montessori Method can positively impact the lives of those living with dementia. vailable for purchase on Amazon and will soon be an e-book on Kindle.